The name needs no introduction. Neither does his restaurant, Noma (at the time of this post being published, is currently ranked at numero uno of world restaurants as per San Pellegrino’s Top 50 restaurant awards). 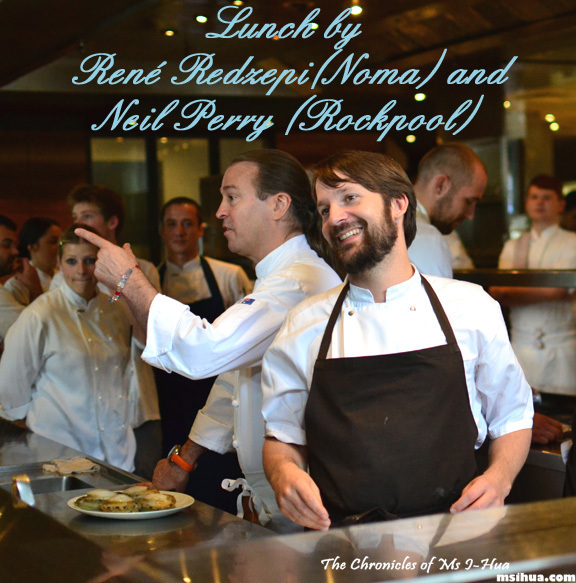 During the recent Melbourne Food and Wine Festival 2012, it was announced that René would be paying a visit and that he would have a showcase luncheon at Rockpool Bar & Grill together with Neil Perry. The day the tickets went on sale, was a rapid fire, walking on clouds, angels singing day. The tickets were sold out in 4 minutes. 4 minutes! The enormity of that news and how I’d managed to get 2 tickets in that time space, still makes me dizzy. The tickets weren’t cheap either. At $250 a head, I decided that it was a once in a lifetime opportunity (unless I flew to Denmark), and that it’d be the Boy’s, Christmas and Birthday presents (Wham, Bam, Thank you Ma’am!). When we arrived, the enormity and poshness of the day hadn’t really sunk into our heads. It didn’t take long for it though. We were greeted with champagne on arrival and advised to mingle around. As we walked around trying to locate our seats, we saw name cards for David Chang (Momofuku), Massimo Bottura (Osteria Francescana), Mark Best (Marque and Pei Modern). It took a while for me to step out of my comfort zone (away from the camera) to mingle and speak to the chefs from Noma, who were walking around and mingling with all the guests. However, it just seems to us (myself in particular) that for food lovers and groupies (again, myself), that it is similar to speaking to a rock star. True, they are everyday people as well, but the feeling is one of star-struckness. Once everyone had calmed down enough (I was having a groupie-gasm moment), both Neil and René came out for introductions and an opening speech. 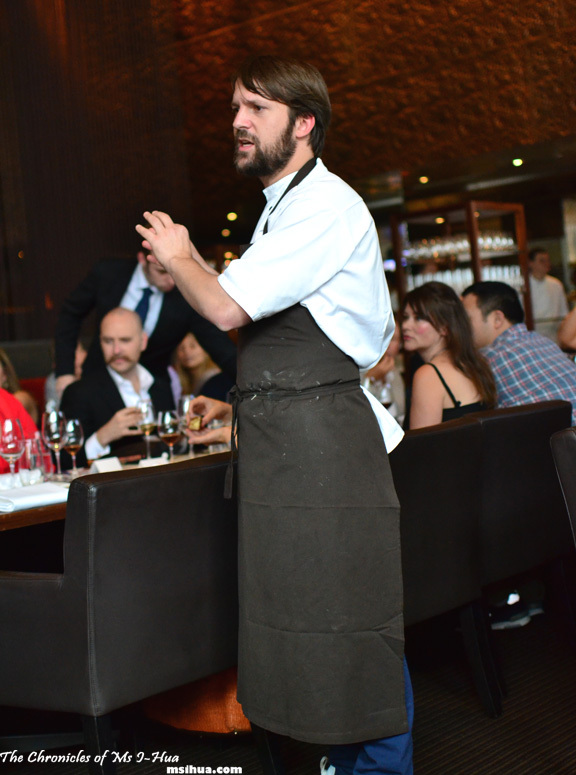 They also did this for each of their dishes, each introducing their dish (in alternation) to the crowd. 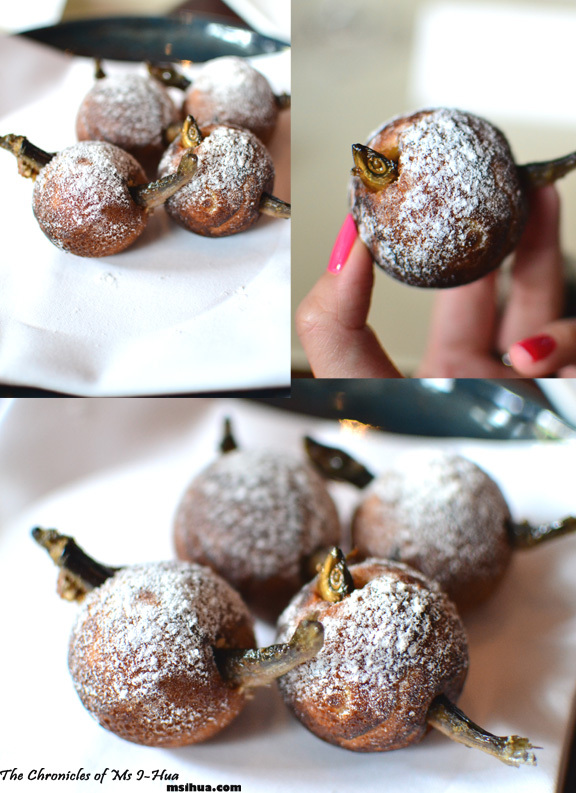 Æbleskivers by René Redzepi. Paired with NV Rare Wine Co. Charleston Special Reserve Sercial Madeira. This was one of the most fun food I’ve had to eat in a while. Æbleskiver is traditionally a baked Danish pancake. However, apart from being baked, light and fluffy, the similarities of a normal traditional Æbleskiver ends there. The Noma version is served with pickled cucumber (placed inside) and speared with a tiny piece of smoked muikko (a tiny freshwater fish from Finland). René mentioned that the insertion of the fish was through inspiration from “Asian streetfood” and that the Æbleskivers should be eaten whole. Next up was a classic Neil Perry dish, his signature Congee with White Cut Chicken, paired with 2011 Crawford River Riesling Henty, Vic. I have to admit, the texture of the congee was really good, but if it didn’t come with the spicy spring onion and prawn oil and superbly tender and moist chicken breast, I would have been quick to dismiss it. The congee had most of its liquid taken out leaving it with a more porridge-y texture. Together in the congee was century egg, fat choy (Chinese Moss) and chilli oil which was quite subtle in flavour and not overpowering at all. The paired wine to this was a very light, floral and sweet Riesling. The next dish was another Noma dish. This time, an amazing Raw Squid with Whitecurrant Juice and Douglas Fir. Paired with a 2010 Wittman Estate Riesling Rheinhessen, Germany. This was my favourite dish of the day. The texture of the squid reminded me of the coconut jellies (nata de coco) you would get in Bubble Teas. Springy, yet firm. At the merest sip of the broth, I was offered the briefest trip to the sea. A clean beautiful sea with no waste or pollution. Crystal clear as I would imagine myself at on a holiday. To eat it, we were advised to swirl everything once or twice to let the fragrance and taste mix together. I also have to say at this point, that the sea blight, samphire, and assorted herbs you see on the plate was sourced by none other than Matt Stone (from Greenhouse). René and his team had a dinner event at the Greenhouse the night before, and had spent a couple of days together with Matt and his team exploring sustainable fresh produce from Victoria. The next dish up was another Neil Perry classic. 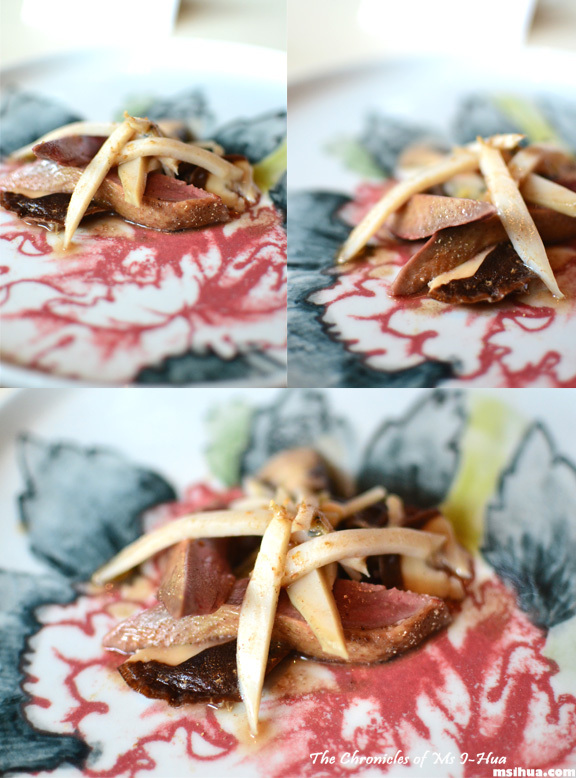 Drunken Pigeon with Abalone Salad. Paired with a very light 2010 Mac Forbes Woori Yallock Pinot Noir, Yarra Valley Vic. It was a very rich dish, in terms of quality and taste. It’s not everyday, one gets to dine like an emperor and eat abalone in abundance! The only other time we usually have abalone is during Lunar New Year. 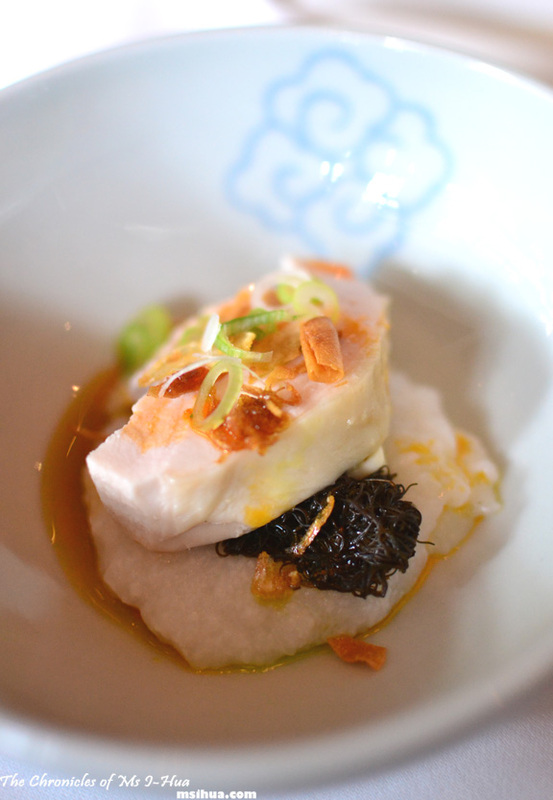 The entire dish was beautifully balanced with the delicate infusion of Shaoxing Wine. The last René Redzepi dish was the Boy’s favourite. Dried Scallops with Grains and Watercress. Paired with 2010 Mauro Molino Barbera Piedmonte, Italy, which was full bodied and well rounded. Another sea inspired dish, this to us, represented the fragrance of the sea. It was similar to eating (or drinking) a pure “handful of the sea”, in terms of fragrance and not taste (as that would be much too salty)! Served with a puree of oyster, watercress and parsley emulsion, we would describe it as a wilderness dish, the epitome of René’s style of “hunt, forage & gather”. This dish brings together elements of the sea and land in the nuts, grains, oysters and scallops served. 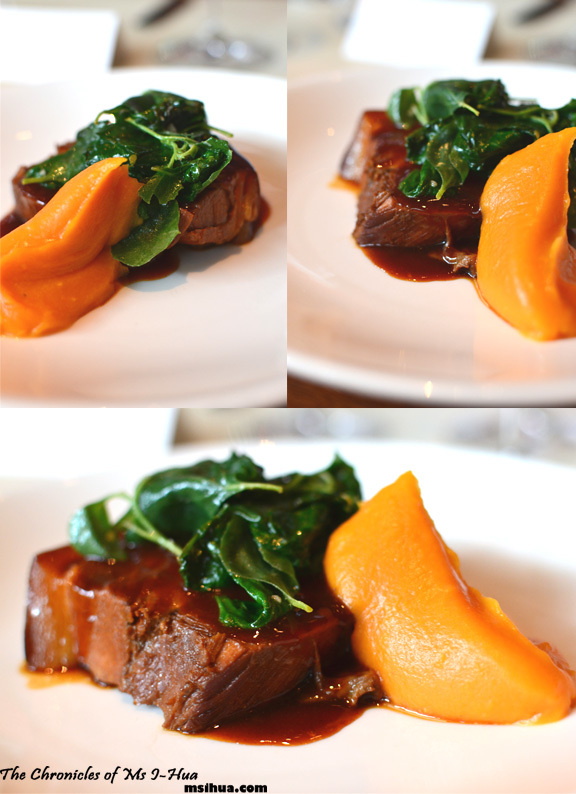 The last savoury dish was Neil’s Red Braised Pork with Salt Bush and Warrigal Greens. Paired with 2010 Pyrette Syrah, Heathcote Vic. This pork shoulder dish was very both tender and heavy. The saltiness of the pork (derived from the fermented red bean curd and five spice mixture) was perfectly paired with the sweetness of the yam and ginger puree on the dish and this went very well with the wine. Before we knew it, the lunch was almost over *wails* and desserts were soon to come out *cheers*. 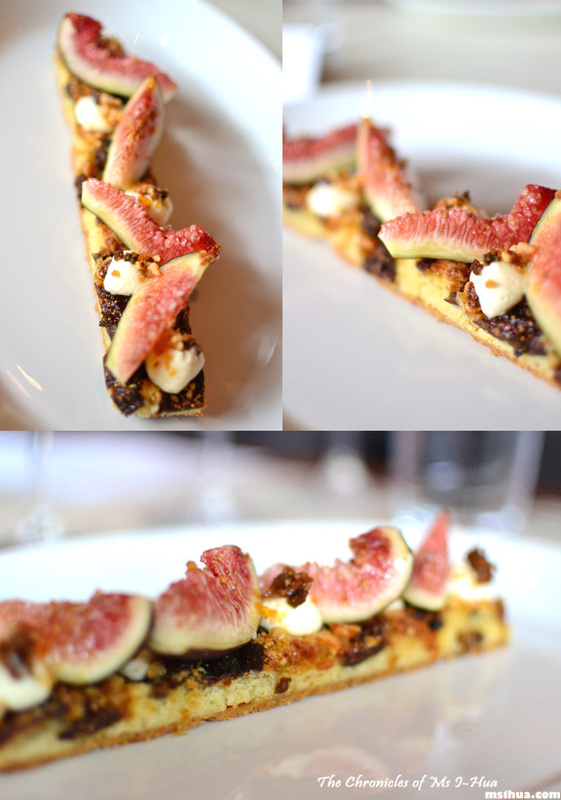 Fig and Hazelnut Tart with White Clover Honey Mousse. Paired with 20 year old Quinta do Vallado Tawny Port Douro Valley, Portugal. Cherry Jellie and Peanut Chocolate Bar. The desserts were good. I was a tad (just a tad) sad that Rosio Sanchez couldn’t showcase her skills at the Rockpool event. Matt Stone didn’t help either when describing how good her dessert was at the “Direct from Denmark” event at Greenhouse on the night before. It just made me more jealous and determined to one day get a taste of her food, and fly to Denmark! 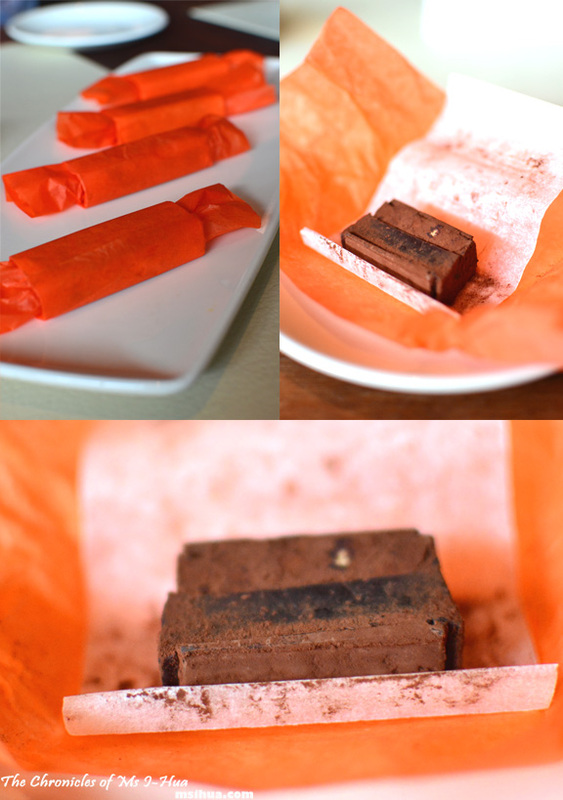 To finish off our dream lunch, we had Jing Teas and Candy Corn (so addictive!). All alcohol which were paired with the food was done remarkably well. My favourite would have to be the Madeira (I’m a sucker for sweet and sticky wines) and the 20 year old Tawny Port (I have great tastes 😛 ). Although saying that, the Madeira that was served wasn’t terribly sweet or as strong as I’m used to. 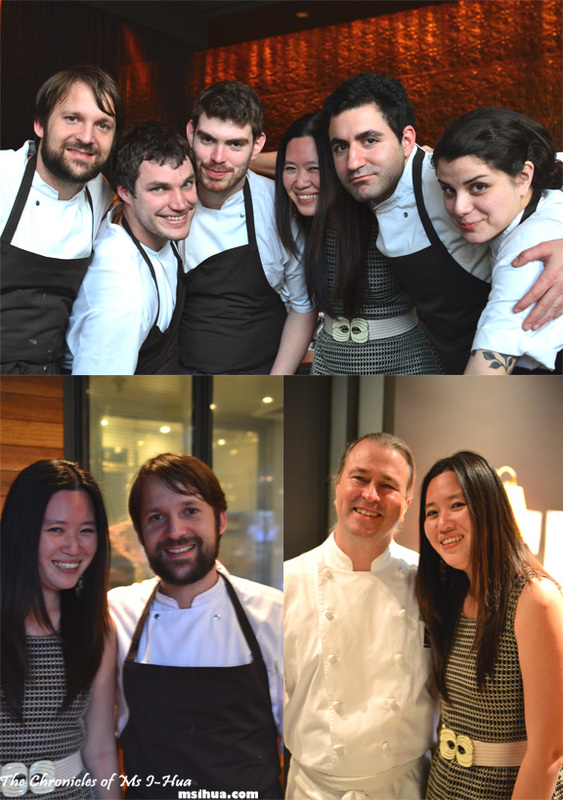 Of course, I managed to pull some groupie chef shots! I was after all suffering from groupie-chef-gasm!! 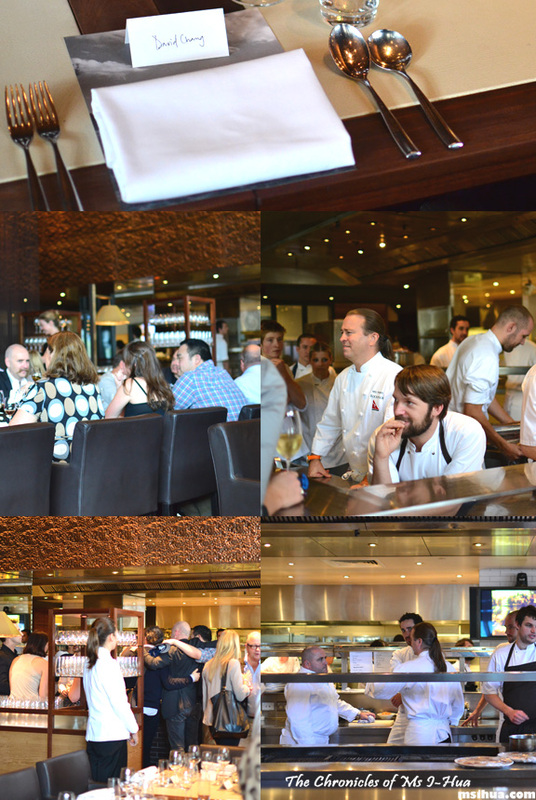 At the end of the lunch, all the chefs came back out to mingle and to tell the crowd what a great time they had in the kitchen! 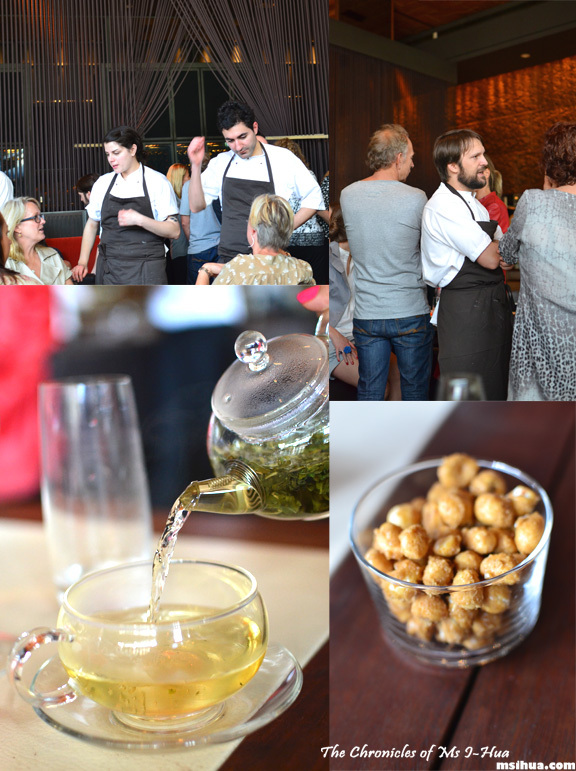 This was definitely a dream come true event, as the Boy and I have always wanted to visit Noma for a meal! Now that we’ve had the Noma chefs fly to us, I can 100% assure you that if you do end up at Noma (Please Take ME!!!) that it will be a phenomenal and mind-blowing experience. However, we are aware that this is a one-off opportunity to dine and chat with the chefs under a relaxed casual atmosphere. 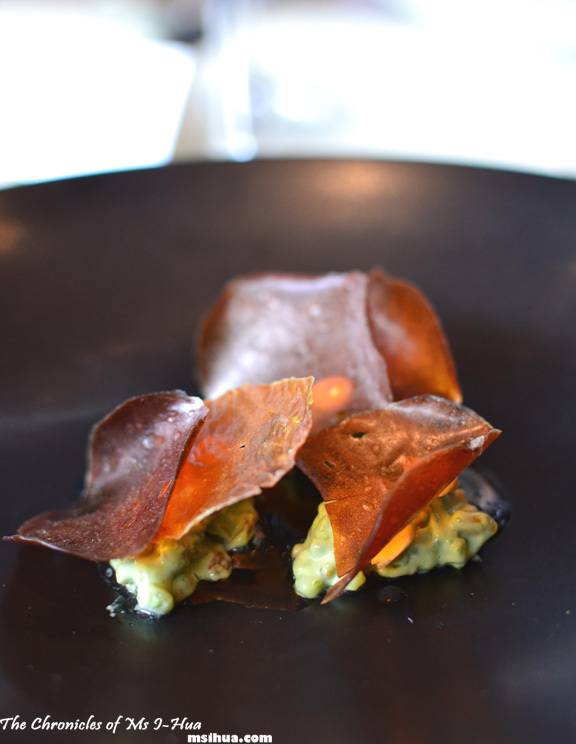 René’s dishes were the merest glimmer of the spectacular items that you can expect from the full Noma menu. The one’s showcased offered us brief journeys to the seaside with a hint of the forest and sea floor. For now, I bid you Farvel! 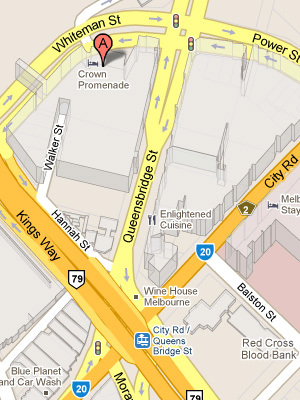 Event: Lunch by René Redzepi & Neil Perry at Rockpool Bar & Grill Melbourne. WOW. Colour me green with envy because this meal took my breath away just reading it, let alone you (Miss Groupie) who had the chance to experience it. And I couldn’t help chuckling , indeed, serving traditional Chinese food can be very stressful when serving to chinese people! OMG! What an epic lunch! Dining in Noma is definitely something in my bucket list! I swear a fly could’ve flown into my mouth whilst I gaped at Rene’s raw squid dish. I choose them well 😛 Sooooooo cool.. wait for my next few posts 🙂 There’s more MFWF events to come! Wow, what an epic dining experience! I have to be honest and say I’m a little bit jealous 🙂 I’d LOVE to try Rene Redzepi’s food. Hopefully I will be able to do that one day. I want to fly to Noma too! Totally envious! The dishes are all so beautiful and well presented. …. me want too! It was soo sooo soooo good! Wow your food is look awesome. You really made a very delicate presentation of the food. Love it. Yes, like I live vicariously through all your travel posts! I think you had to be there, what an opportunity! Nice fangirl picture of you with Rene! 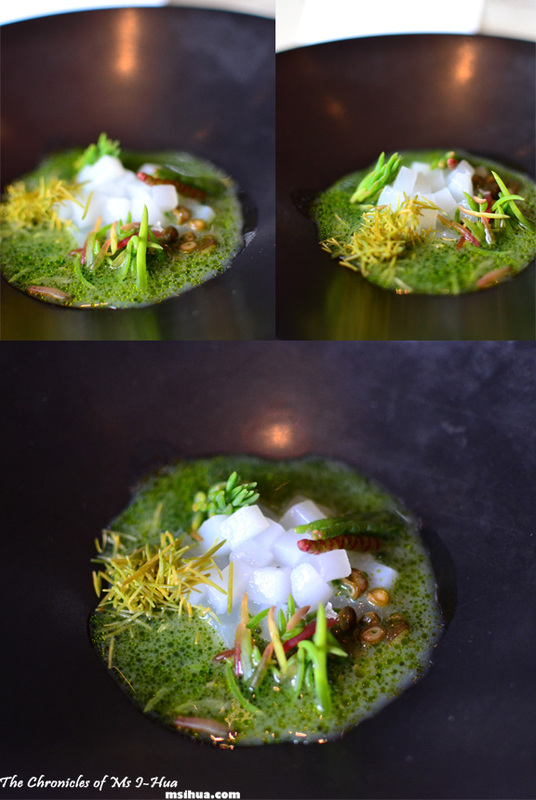 The raw squid dish on the black plate, with the green herbs all around looking like a patch of forest floor– wow! I have been a vegetarian for 15 years, and yet this night would have perhaps been the only thing that could possibly get me to eat meat one more time – sigh, oh well, maybe he will ocme back next year! Hahahaha.. luckily for us, it was lunch and I slept and had a hangover by 6pm! Whoppee!! Oooo… I don’t even know who that is but yayy for a Noma alumni!